An unfortunate consequence of the success of the cave-à-manger concept - the hybridization of wine shop and restaurant / bar, ubiquitous in Paris - is that the term has lost a bit of specificity, and now encompasses everything from the 11ème's tiny Au Nouveau Nez, which serves only cheeses and meats, to the comically pretentious team of radish-fetish nitwits at 2ème restaurant Saturne. Before actually entering a place, it can be tricky to differentiate those with 36€ set market menus from the ones where one can just chill and nibble on things. I'd cite this as the reason why it took me so long to check out Le Vin Au Vert, a magnetically down-to-earth cave-à-manger on the mangy side of the 9ème. 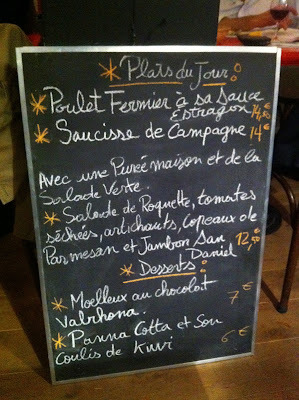 It wasn't clear to me whether the place was a wine bar or a restaurant, and I don't get to the 9ème often enough to chance a night out on a possible misconception. When I finally did drop by with friend J, seeking better drinks than were available at the launch of my friend's literary magazine nearby, our hearts sunk upon noting through the windows that almost all tables were occupied with folks eating. We asked with exaggerated trepidation whether it was cool if we just sat and had drinks. 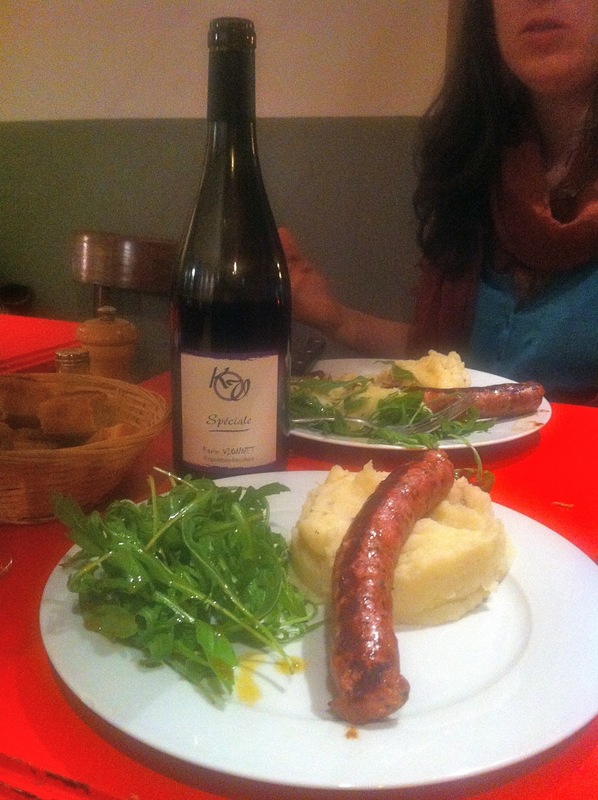 "No problem," we were told, because it turns out we'd arrived at one of the few* genuinely chill natural wine joints in Paris, one run by extremely nice fellows, another rarity. You could call Le Vin Au Vert an example of a strict constructivist cave-à-manger. It's a wine shop you can eat in, with no bellls, whistles, or cucumber foams. (Also, for once, no set menus!) The physical space is divided very cleanly between cave and restaurant / wine bar. A miniscule kitchen and service bar occupy a corner in the back. The effect is spare, and unassuming to the point of looking like the place was opened yesterday on a shoestring. In fact owners Etienne and Sebastien opened the place two years ago. From what I saw on two recent visits the only testament to the time passed is a collection of empty memorable bottles tucked under the whiskey selection. When J and I sat down at a big four top on the night we visited, we were both struck with that self-consciousness familiar to those who've worked in restaurants, when one feels bad for taking up a dinner table for the pittance one has planned to spend on a bottle of weeknight wine. We were relieved to be joined by J's wife C, and our friends R and A, who helped us polish off several bottles, thereby making a respectable contribution to the night's check averages. All wines at Le Vin Au Vert's cave section are marked at prix caviste, and there is the standard 7€ corkage for opening them in the restaurant / bar. 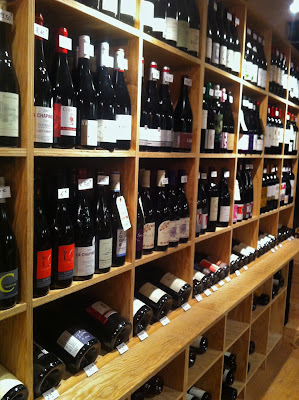 I'm not sure whether Etienne and Sebastian are underestimating their clientele, or whether the Barbès-adjacent neighborhood is really just that tight and leery, but the selection of mostly-natural wines at Le Vin Au Vert is among the cheapest I've seen in a quality establishment in Paris. It would be hard to spend serious money here, which makes the spot perfect for many occasions, and unthinkable for certain others. A place to celebrate Thursdays, not birthdays. 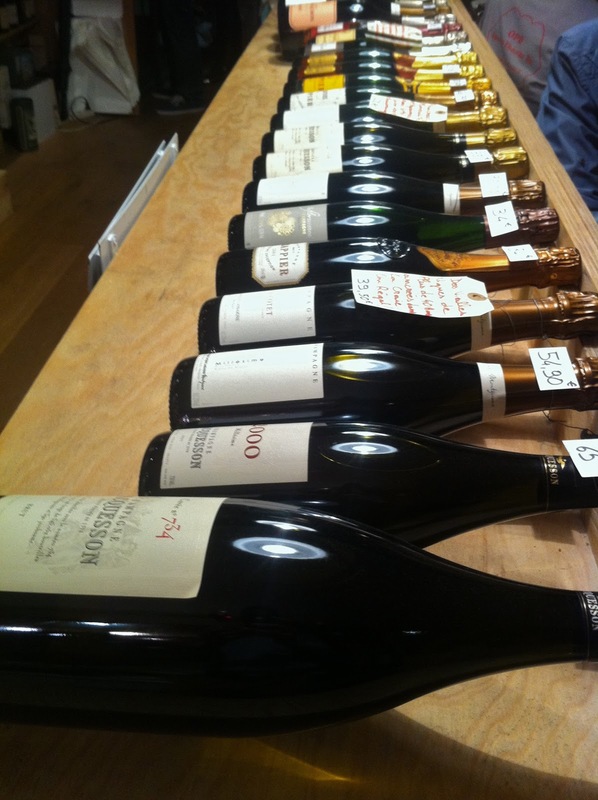 There's nevertheless an appreciable Champagne selection, and a small range of pricier natural classics from Ganevat, Philippe Pacalet, etc. is available. J and I were more interested in the pokier selections that evening. (Like, alas, most evenings.) After demolishing a familiar bottle of our friend Karim Vionnet's brilliant schiste-soil Beaujolais-Villages "Cuvee Speciale,"** we reverted to drinking white, and Sebastien proposed a dry muscat by Rietsch, an Alsatian producer neither J nor I had encountered before. I was pretty much sold on the phrase "dry muscat," which to my ears rings like "early Motown" - something that is just reliably enjoyable (if not always especially deep). Rietsch, I discover now, are a family-run estate of a little over 11ha based in the commune of Mittelbergheim, around the midpoint on the Route des Vins between Strasbourg and Colmar. The estate was founded in 1970 by the parents of the present winemaker, Jean-Pierre Rietsch, who from what I gather is a very open-minded and questing sort of vigneron. 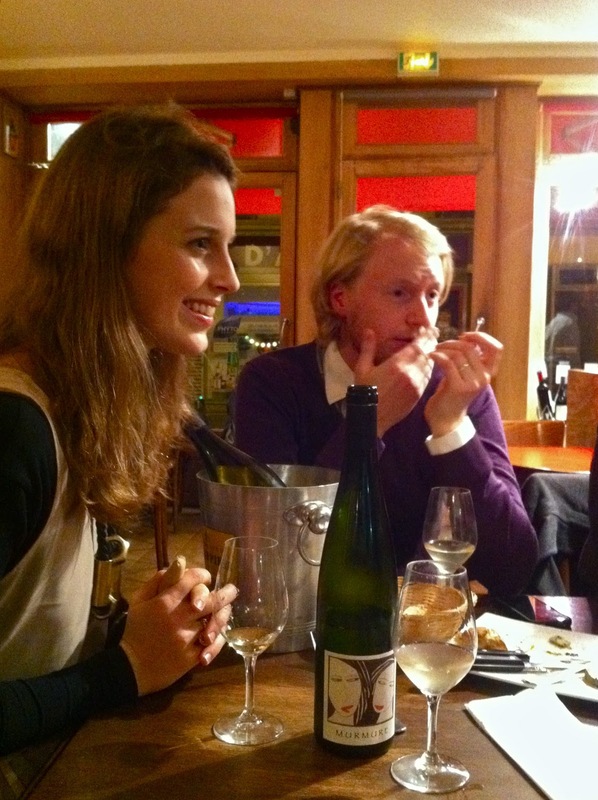 (Check the surprisingly professional website, which includes what I'd judge to be a very sane and refreshingly unpoetic essay on the concept of natural wine.) 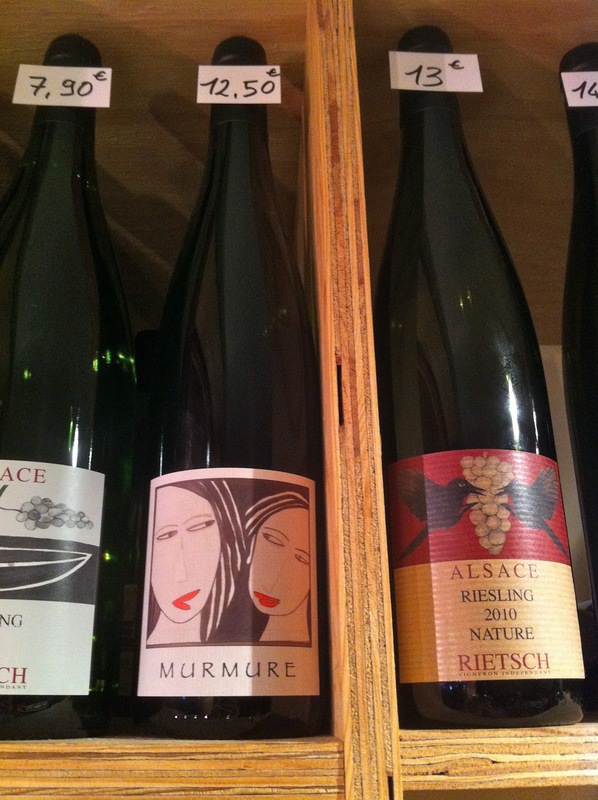 The estate began conversion to organic viticulture in 2008, and each year Rietsch makes several cuvées sans souffre. 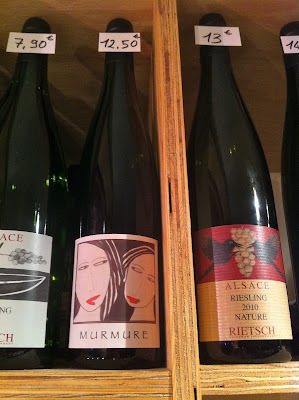 The 2010 "Murmure" that we shared that evening was one of these cuvées, a fact manifested in the wine's light effervescence and waxen color. (The latter also possibly deriving from 7 months on the lees.) The nose was white flowers and fresh clementine, buoyantly expressive - the sort of wine you can forget to drink and just sniff. *** The palate stood up admirably as well; it was as dry as advertised, with nice minerality and notes of pear and of grapefruit pith. My friends and I left that night totally satisfied, and as ever when I find a new place I like, I was eager to add it to the ol' blog. But in this case I felt I ought first to return to sample the limited menu on offer. Given just how limited Le Vin Au Vert's menu is - appetizer options amount to sharing a plate of cured meats - I probably should have known not to bother. Not because the food wasn't tasty, but because it was utterly predictably unballsupably fine. Crispy sausage, flavorful mashed potatoes, fresh leaves of salad: sort of like Le Verre Volé, only without the temptation to order a zillion appetizers, and without having to reserve beforehand. I get the impression some people are disappointed by this. Not me, not most nights. Nor my visiting friend M, who I'd brought on that second visit to Le Vin Au Vert. She had just returned that day from some sort of solo spirit pilgrimage to the grand crus and great restaurants of Champagne****, which journey had itself been preceded by a week-long tour of Barolo with a bunch of Chinese wine collectors. It seemed safe to assume that by that point in her travels she'd feel like I often do in Paris, that sometimes what pleases the most is that which attempts the least. 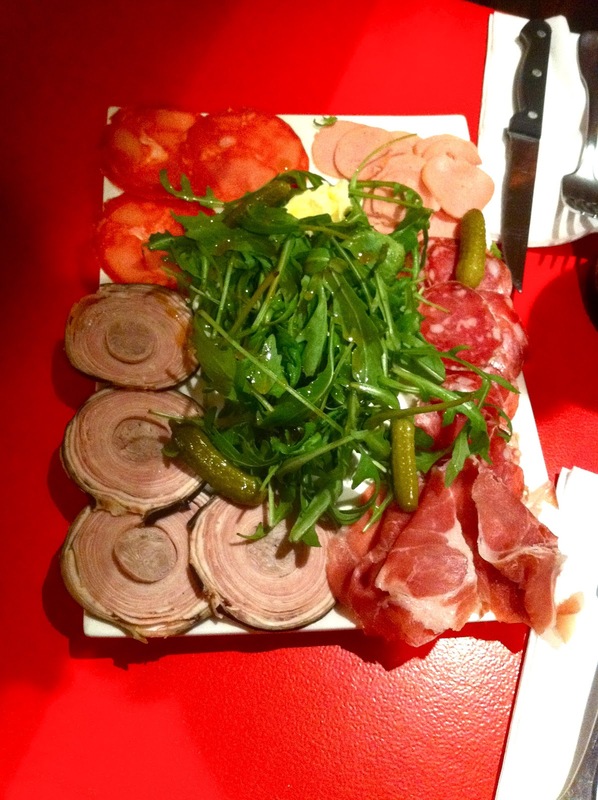 * A very short list that includes Chair de Poule, Les Quilles, Cafe de la Nouvelle Mairie, and Les Pipos, and Aux Tonneaux des Halles. ** This one was showing a little reduced at first. It went away. When this bottle is in top form it rivals Foillard's "Côte du Py" for just over half the price. *** Another good way to save money, by the by. **** "Not a lot to see there," she concluded.